Arpeggios are one of my students’ favorite technique skills. It’s probably because they sound so awesome and show-off well in pieces. But it’s also an easy technique concept to teach and use earlier in their learning. I usually teach these right after they learn Major 5 finger patterns and triads. When crossing hands, call out the top note as students head down. I’ve noticed that if I call out the root of the chord, students can’t find the top note that comes before that on the way down. I promise this really helps students remember where to place that LH thumb on the way down! Say note names out loud. It helps that memory stick and reinforces theory work. Use the metronome. 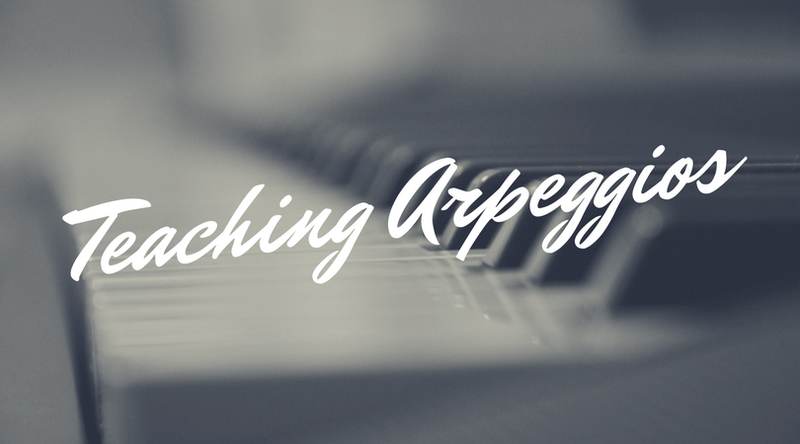 Help students keep arpeggios steady from the very beginning. When blocking, hold each triad for 3 beats. Then encourage students to keep counting as they break into single notes! Now when they can play their arpeggios smoothly and correctly, they’ll know they’re onto something. To celebrate this moment, I love to have them play their new smooth arpeggios one more time with the pedal. The look on their faces when they hear how cool it sounds – how professional it sounds – is one of my favorite moments in teaching! So why not expand that moment with a fun game? Today I want to share a game for to play after a student has learned their white key arpeggios. It’s a new game I was introduced to by my husband called, “Don’t Eat Pete!” It was a childhood game for him so most of you may already know it but I’ll explain the Arpeggio Style twists I’ve added. First, set out the game board and cover it with small candies or tokens of some sort. I’ve used M&M’s, Smarties, or Japanese erasers – really whatever was on hand during that lesson in my studio! Now cover all 12 squares with a candy/token. If you’re playing with a group at group class, have one person step outside the classroom at this point. The other students in the classroom must quietly agree on one square that is “Pete”. Then have the student in the hallway come back inside. This student will begin removing the candy/tokens one at a time. He or she must correctly name the arpeggio (key and Major or minor) and play that arpeggio to earn the candy/token. They may be able to play a bunch or just a few before they touch the “Pete” square candy/token. Then everyone yells, “Don’t Eat Pete!” and the game starts over for another student. If you’re playing it in private lessons, the teacher will set up the board and just pick which square is “Pete”. Then have the student play through the squares and earn their candy/tokens till they come to “Pete”. I love switching with the student and having them pick an arpeggio on the board for me to find “Pete” as well! If it’s too tricky, this could also become a triad practice game as well! Or for more advanced students, use regular one handed arpeggios with various octave requirements to make this simple game more difficult. I hope you’ll try it out this week and enjoy teaching those hand-over-hand arpeggios. Download here: Arpeggio – Don’t Eat Pete!